There’s something about Opening Day in baseball that no other major sport can rival. For Major League baseball fans all across the country, everybody’s favorite team is in first place on Opening Day. It’s a fresh start, a new beginning. It’s a time of expectation. Hope springs eternal for a successful season. Opening Day is in fact a harbinger of Spring and the warmer weather of a summer yet to come after an often cold and gloomy winter. Sometimes it rains, but it doesn’t snow much after Opening Day. Fans flock to the ballpark for that very first game. This year, the season opens on April 3, 2016 and under the current playoff format, for a few select teams, the season may last 180 games or more. It ends sometime in November with one team claiming the World Series title. It’s a marathon, not a sprint. Speaking of what could be good again, over on the north side of Chicago, there’s some optimism about the forthcoming Chicago Cubs season. After an unexpected deep run in the 2015 play offs, many think this just may be “the year” for the Chicago Cubs. The year that ends the 71 year absence from the World Series and the 108 year drought without a Championship season. It’s the longest ANY professional sports franchise has gone ever without winning a title. It’s no secret I’m a lifelong Cubs fan. Family and friends have struck up conversation with me recently asking what I thought of the forthcoming season. Will I cheer for them? Yes. Will I watch a few more games on TV than normal? Yes. Will I go out to Wrigley Field to see a few more games? Likely not unless I get more donations to the “GoFundMe” account. The common fan has been priced out of the ballpark. Have you seen the price of tickets these days? However, if you want to take ME out to the ballgame, by all means, give me a call. 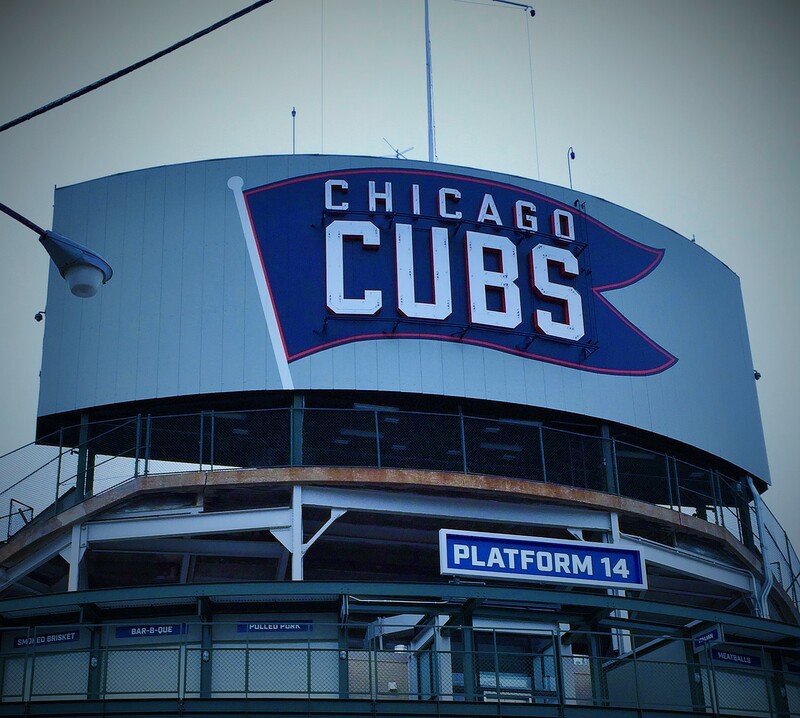 So this weekend, I’m gonna root root root for the Cubs on Opening Day as the 2016 baseball season begins. And you can root root root for your team too. And if, on a chilly day in November, one of our teams hoists the trophy, we can say it all began in April. Having hit a writer’s block, I opted to take a trip to the local grocery store to find inspiration. Now they have recently remodeled the aisles. In a stroke of corporate genius, this grocery store decided to switch all their products around. For example, they put the soup where the soap used to be. Then they took the crackers and put them where the paper towels once were. This led to me once nearly heating up a bowl of dish soap while cleaning my dishes with some minestrone on a paper towel. It’s confusing out there folks. At this time of year, I knew it was going to be a challenge to find a treat that wouldn’t make the waistline grow. After all, it’s the season when sweets proliferate the grocery store shelves ranging from chocolate bunnies to marshmallow chickens. 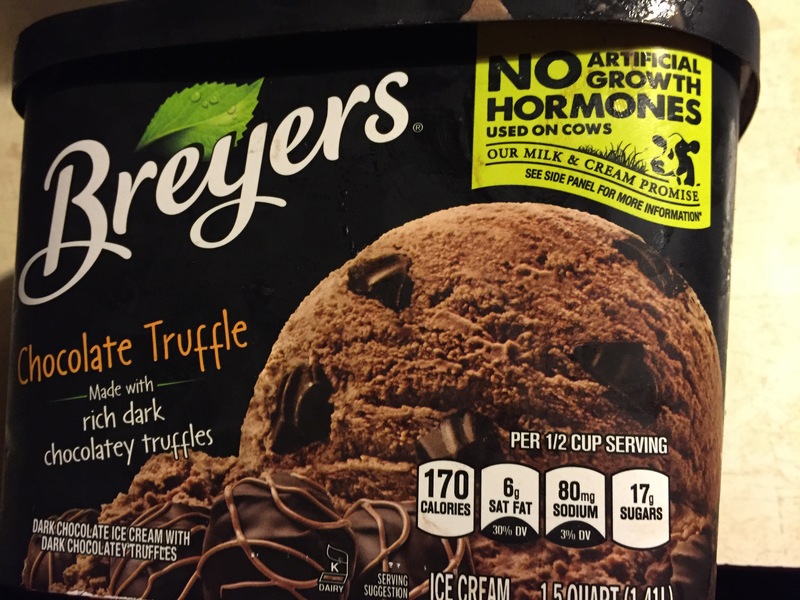 Sure, the whole sentence it said “No Artificial Growth Hormones used on Cows.” But, all I focused on was, “No Growth.” Presuming his to refer to my waistline, I instantly grabbed the carton of Chocolate Truffle ice cream and came home for inspiration. This snack was decadently delicious. 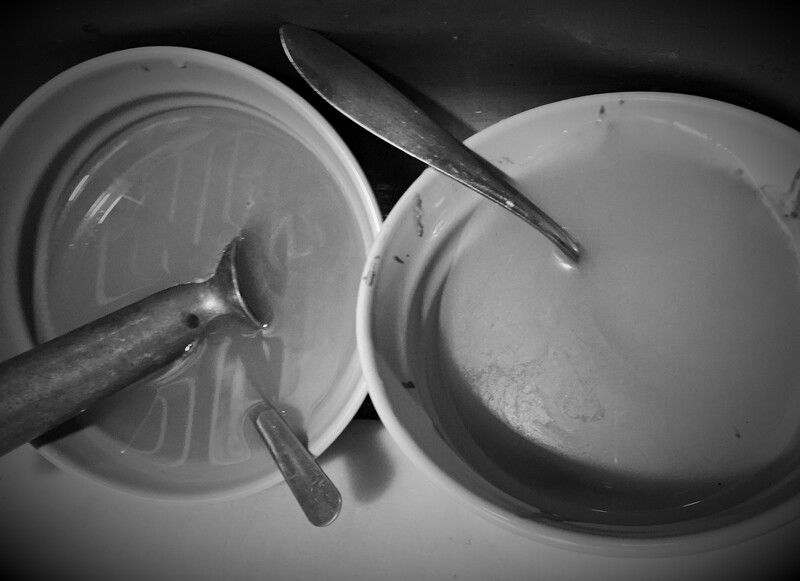 As you can see from the cover photo, the Chocolate Truffle ice cream has been consumed and the bowls are rinsing in the sink. Me, I’m sitting here looking at my waistline and so far see no noticeable growth. Ah, truth in advertising. As you can tell from this post, I was inspired. Happy Easter, if you celebrated it. For fun this year, try putting one of those marshmallow peeps in the microwave. You won’t regret it. FOOTNOTE: One of my first posts alerted the readers to the value of reading the labels on the packaging when shopping at the grocery store. While I found different values this evening, this post has some good information. Here’s “Flavorful Findings,” in case you missed it. Dreams are kind of a weird thing. We have them when we sleep and all too often forget them by the time we awake in the morning. Sometimes they awaken us in the night because they are so darned scary we’re afraid to go back to sleep. Sometimes they awaken us in the night and they’re so darned good we try to go back to sleep to get back to the story but alas, we are unable to traverse there again to recreate the magic moment. Then there’s the recurring dream. The one that happens again and again in your sleep. Until this week, I’ve only had one recurring dream. I’m driving in a convertible up a very steep bridge over a very large river and the slope becomes so steep I am desperately clinging to the steering wheel, fighting to not fall out of the back of the car and plummet to the raging waters below. Then I wake up. I only had that recurring dream a few times many years ago. I never fell. I woke up, took a drink of water, thought nothing of it, then went back to sleep. There they were again in the dream, not having made a connection yet, but still at that same business convention, he in the suit, she with the fancy bag. Alarm chirped. Dream over. I jotted down some notes because it was so vivid, so surreal, I knew I’d forget it if I didn’t. What the heck was my letter sweater bag doing in this dream? Next night, I fall asleep. The scene of the dream returns. Same alluring woman, same business man. This time the scene was what may be an after party at a bar. She’s carrying the same bag and slips over to Mr. Businessman and surreptitiously shares the contents of the bag with the man. The plastic bag is filled with a big pile of gold chains, like the ones you wear as jewelry. All are different styles. All are connected together by the clasps at the end of their links. There are hundreds of them. I woke up momentarily, then nodded off again and the dream came back. There was the business man and the alluring girl, fancy plastic shopping bag full of gold chains in hand. They were at a train station. Alarm chirped. Dream over. But not before I dreamt it four times in succession in two nights. At this point, I don’t know what the dream means or what the man did with the chains or what the lady did have in mind for the bag o gold chains. But, if I find out in another dream one night, I’ll let you know. 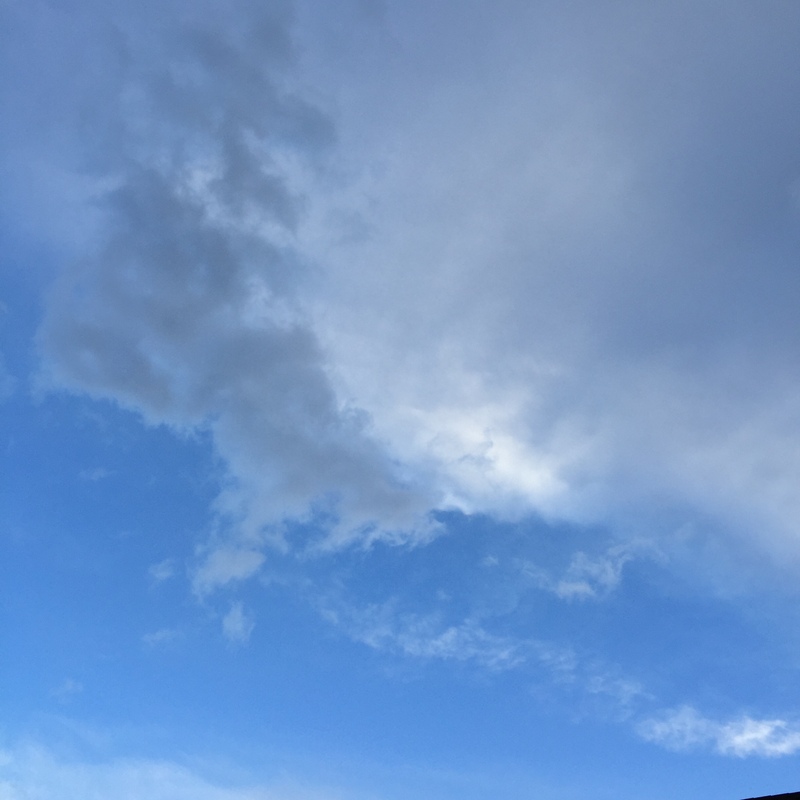 FOOTNOTE: Why a cover photo of a cloud? Dreams remind me of clouds. They are there in our lives to be sure, but they kind of hover out there in a different spatial reality where you know they exist, but you can’t quite reach out and touch them. Sometimes you dream at night and sometimes you don’t. Sometimes there are clouds in the sky, and sometimes the sky is clear. You have no control over your dreams. Likewise, you have no control over the clouds.